The 2.4RX01-1.8m radar positioner is designed and built to provide high reliability and to withstand severe environmental conditions. 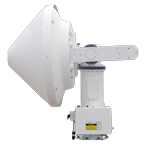 A high quality, high-precision elevation-over-azimuth radar antenna positioner is suitable for operation in X Band. Available with customizable mounting options. Gold-on-gold contact slip rings facilitate unlimited azimuth rotation. Offers smoothly controlled high speed slewing and precision scanning speeds. Standard equipment includes internal ACU antenna control unit, AC or DC power, 100BASE-T Ethernet, and a complete tool kit. The 2.4RX01-1.8m radar positioner is typically used for advanced meteorological and environmental analysis radar applications.